Powers/Abilities: Oddball's powers and abilities are largely unrevealed, but presumably he possesses juggling skills similar to the original Oddball. History: (Union Jack II#1/Official Handbook of the Marvel Universe A to Z Vol. 3 (Crossfire) (fb) - BTS) - Orville Bock joined the Death-Throws as the new Oddball to replace the late Elton Healy. (Union Jack II#1 (fb) - BTS) - The Death-Throws were hired by R.A.I.D. and helped into London by Fasaud. (Union Jack II#2) - Oddball and the Death-Throws were sent to destroy Tower Bridge. Concerned when Tenpin was taken out by Sabra, Crossfire told Oddball to continue their massacre since they were being paid by the body. Not long after Union Jack arrived in a S.H.I.E.L.D. flying car (taking out Ringleader and Knickknack), and with Sabra, took Oddball out. (Dark Reign Files) - Quasimodo researched the Death-Throws including Oddball for Norman Osborn. (Loki: Agent of Asgard#8) - Oddball joined the Death-Throws, led by Ringleader, in a heist at the Big Top Casino in Las Vegas. They were thwarted by Loki when he hit a knockout gas ball tossed by Oddball back at them, leaving the Death-Throws behind unconscious for the authorities to pick up. 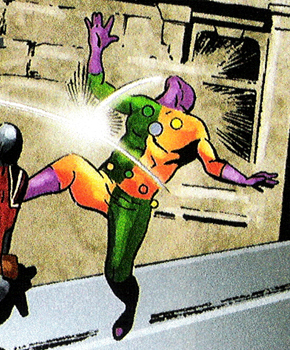 Oddball received a profile in the Dark Reign Files handbook as a member of the Death-Throws. His real name was revealed in Crossfire's entry in the Official Handbook of the Marvel Universe A to Z Vol. 3. Total shot in the dark here, but could Orville Bock have been the mysterious Mad Juggler prior to his recruitment into the Death-Throws as Oddball? The other mercenaries hired by R.A.I.D. in the London attack included Boomerang, Corrupter, Ecstacy, Firebrand (Broxtel), Jackhammer, Jack O'Lantern (Levins), Machete (Mariano Lopez), Shockwave (Sneed) and Zaran (Maximillian Zaran). However, since Oddball only worked with the Death-Throws and not with the others, they're not counted as allies. Apologies for the above image. In his debut Oddball appeared in two panels. This was the better of the two, if you can believe it.